A wonderful piece of art by Chanel from the Cosmos collection featuring a multitude of round diamonds with delicately placed emerald cut, baguette, pear shape, princess cut and trillion cut diamonds set in 18k white gold. 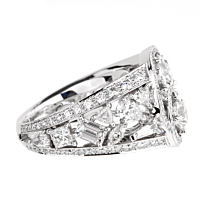 The round brilliant cut diamonds have a weight of 1.23ct and the multi shaped diamonds have a combined weight of 2.78ct. 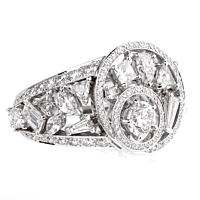 All diamonds are matched at VVS Quality and F-G in color.